Beck, Sanderson. INDIA & Southeast Asia to 1800: Ethics of Civilization. California: World Peace Communications, 2006. <http://www.san.beck.org/2-9-MughalEmpire1526-[স্থায়ীভাবে অকার্যকর সংযোগ]	1707.html>. Desoulieres, Alain. “Mughal Diplomacy in Gujarat (1533–1534) in Correia's 'Lendas da India'.” Modern Asian Studies, Vol. 22, No. 3. pp. 454.<http://www.jstor.org/stable/312590>. Haider, Najaf. “Precious Metal Flows and Currency Circulation in the Mughal Empire.” Journal of the Economic and Social History of the Orient, Vol. 39, No. 3 (1996), pp. 298–	364. <http://www.jstor.org/stable/3632649>. India. Indian History: Medieval History. 2005. 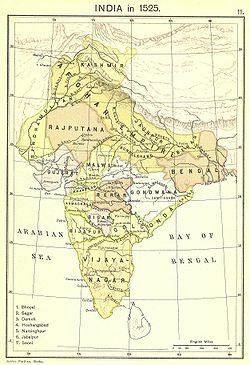 <http://india.gov.in/knowindia/medieval_history1.php>. 3/10/09. Jacob, Lt. Gen. Jack Frederick Ralph. “History: The Battle of Panipat.” Chandigarh Tribune Online Edition, April 24, 2003. <http://www.tribuneindia.com/2003/20030425/cth2.htm>. Richards, John F. “The Economic History of the Lodi Period: 1451-1526.” Journal of the Economic and Social History of the Orient, Vol. 8, No. 1 (Aug. 1965). <http://www.jstor.org/stable/3596342>. SarDesai, D.R. India The Definitive History. Colorado: Westview Press, 2008. Subrahmanyam, Sanjay. “A Note on the Rise of Surat in the Sixteenth Century.” Journal of the Economic and Social History of the Orient, Vol. 43, No. 1 (2000), pp. 23–33. <http://www.jstor.org/stable/3632771>.